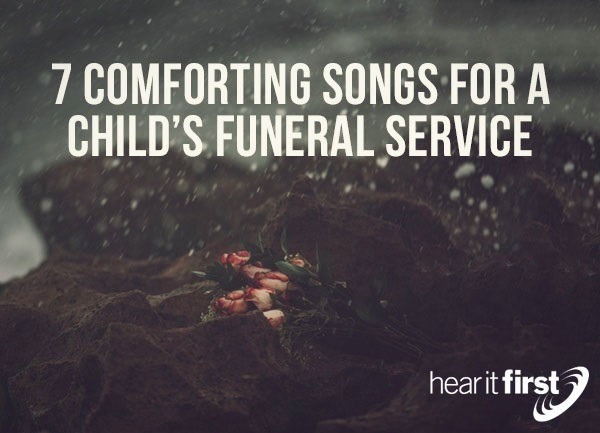 Here are seven great songs for comforting family and friends at a child’s funeral. The song, Borrowed Angels by Kristin Chenoweth is such a touching song that it’s nearly impossible not to cry when hearing it, and even more so at the funeral of a precious child that’s passed into heaven. Take a look at these very special lyrics: “There must be Borrowed Angels, here in this life. They come along, into this world, and make this world bright. But they can't stay forever. Cause they're heaven sent. And sometimes, heaven needs them back again.” Isn’t that so true? We know that these young ones are not responsible for knowing the gospel and it is believed that God will not condemn someone who isn’t old enough to be able to respond to the gospel, so that might give parents some comfort, and even though this song might start a flood of tears, tears are part of the healing process, although no one ever completely recovers from losing a precious child. The song, God’s Will, by Martina McBride, is a deeply moving song about a mother who has only had her son for a short time and I still grieving but from a backwards looking perspective. In her grief, she sings “His mother said, they didn't think he'd live. And she said each day that I have him. Well it's just another gift. And I never got to tell her…That the boy showed me the truth. In crayon red, on notebook paper. He'd written me and God love you.” Although this song seems sad, there seems to be the idea that children are a gift of God who are loaned to us, but only for a time. How much time, we never know? Knowing this, we must commit all things to God, both the good and the bad. The ,song Goodnight My Angel, by Billy Joel ,is a tearjerker to be sure because of the lyrics which address a little angel or child as Joel sings, “Goodnight my angel, now it's time to dream. And dream how wonderful your life will be. Someday your child may cry, and if you sing this lullaby. Then in your heart there will always be a part of me,” and as if anticipating the child’s leaving this earth, he sings “Someday we'll all be gone. But lullabies go on and on. They never die. That's how you and I will be.” I believe this song would be a very stirring addition to any child’s funeral service, hard as it would be. The song, Come Some Rainy Day, by Wynonna Judd, is a very special one to Wynonna as she sings about a sister that’s gone away. She sings, “What good's a dollar. Without your baby sister. Two scoops of ice cream. On a summer afternoon” and sings, while “I sit and laugh with friends. At what we've all been through. And I still catch my breath. When someone mentions you,” because “Baby I still miss you. Come some rainy day.” I believe every parent and relative who has lost a child will be moved by this very compassionate song, sung by Wynonna Judd. How many of us can remember Over the Rainbow from the Wizard of Oz? Most of us can, I am sure, and even today this movie is played annually to remind us that home really is “home, sweet home.” Even with the passing of a beloved child, there is still hope that someday they will see the child again. The lyrics remind us that “Somewhere over the rainbow skies are blue. And the dreams that you dare to dream really do come true and someday, we’ll all “wake up where the clouds are far behind me,” which makes me think of the coming kingdom of heaven when all sorrow, pain, suffering, and even death will be gone and God will wipe away very tear, forever (Rev 21:4). This song about a rainbow might remind of us God’s promise to Noah in sending the rainbow. The song, One More Day, by Diamond Rio, may not be about losing a child, but the words seem perfectly suited for someone who has, as they sing, “One more day, one more time. One more sunset, maybe. I'd be satisfied. But then again, I know what it would do. Leave me wishing still for one more day with you. One more day” so “I'd hold you every second. Say a million I love you's. That's what I'd do with one more day with you.” One more day is all that a parent who’s lost a child desires…but that day will come in the kingdom, if the parents have trusted in Christ. No one can ever completely comfort a grieving parent who’s lost a child. Neither can any song ever take away the pain, but perhaps they can make them reflect on their child’s life and that for the believer, they have hope of seeing them again. For all who trust in Christ, they shall not see the second death. Since a person must be brought to repentance and faith, and only then, put their trust in Christ, it is generally understood that children who die will not face the judgment of God. That should give a little comfort to the parents, because just as King David said of his dead son, in full confidence and assurance, he sounds very much like he will see the child again, saying, “I shall go to him, but he will not return to me” (2nd Sam 12:23).